What is the M-DAC Nano? How was the M-DAC Nano Tested? 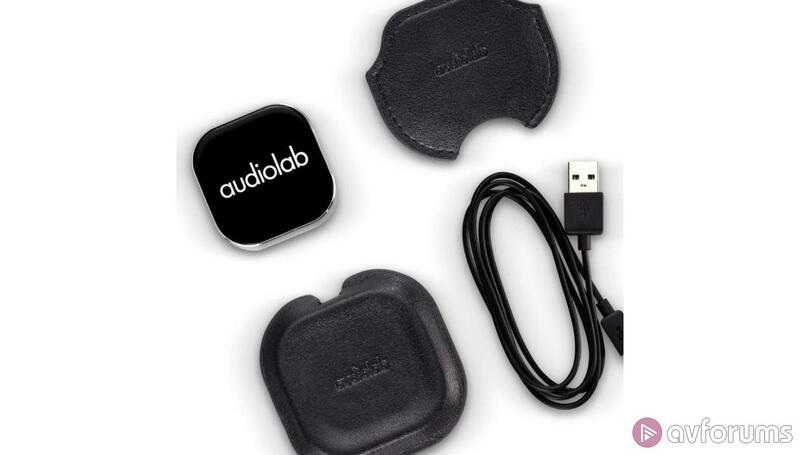 The Audiolab M-DAC Nano is a compact Bluetooth receiver and amplifier, designed to offer the ability to power headphones and earphones with the signal from a phone or tablet - a feature that is becoming more useful as the 3.5mm socket is progressively removed from phones and laptops. Audiolab has recognised that this is a going to be an area that matters over the next few years and given that they’ve just launched two pairs of earphones, it seems like a sensible thing to produce. Of course, products bearing the ‘M-DAC’ moniker have earned a reputation for being more than a derivative take on the business of making a DAC. Even though the Nano is the smallest of the family and is likely to remain that way, it has some tweaks to its Bluetooth implementation that, on paper at least, should make for a very entertaining listen. There’s also the small matter that there is the merest hint of déjà vu here. 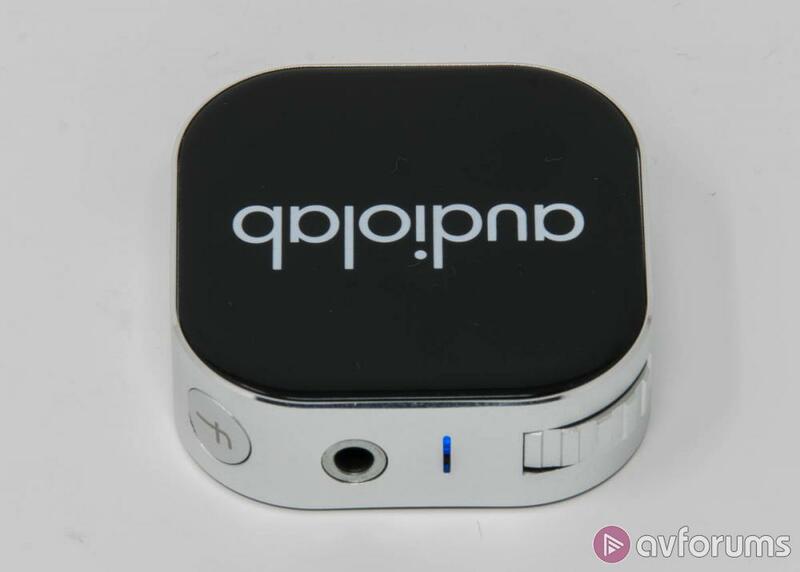 We’ve already looked at a small square device that works as a Bluetooth DAC and that was the Shanling M0 which can also work as a USB DAC and a standalone player. Does the proposed cleverness of the Audiolab justify the extra 50% cost? Let’s get things paired up and work it all out. The Audiolab is a single function device. It is solely designed to be a Bluetooth receiver and has no other form of input and connection. In the context of the rest of the range, this makes a lot of sense. The M-DAC Mini exists to give you a complete DAC and preamp if you want such a thing and by making the Nano a single function device, there are clear gains in simplicity and general construction. The Bluetooth implementation is a v4.2 base with support for aptX and AAC on top of the base SBC codec (and your reminder at this point, that we have a glossary of these terms if you’re looking at that and going “huh?”). This is enough to ensure that it will work as effectively with iOS devices as it will Android ones - and of course offer legacy support. It has to be said that there are some more impressive fitments out there though. The Shanling offers the less used but impressively capable LDAC Bluetooth as well and there is no sign of aptX HD. The use of version 4 Bluetooth rather than version 5 has implications for the achievable battery life of the Nano. 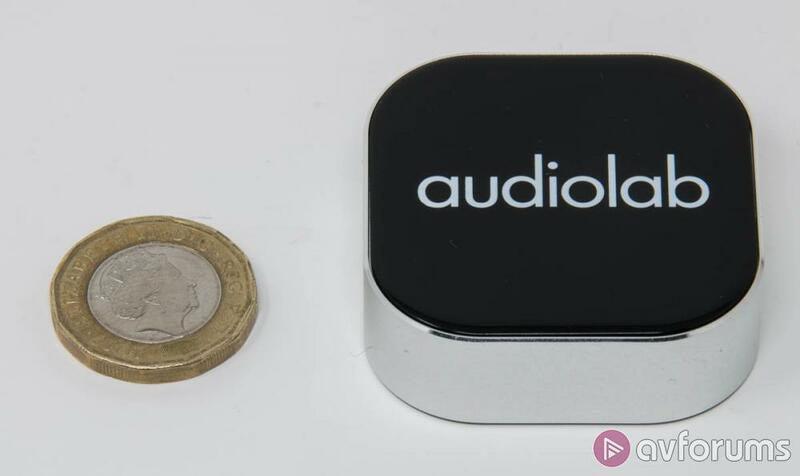 This is borne out by Audiolab’s own figures which give the Nano a claimed life of eight hours which should be enough for a decent trip out and about but doesn't get close to some of the figures we are starting to see from Bluetooth 5.0 devices. The claimed two hour recharge time is rather more impressive though and ensures that you can boost it readily enough. Beyond the posted specs, the Nano has a secret weapon in the form of an ‘enhanced mode.’ This uses the 384kHz capable DAC to perform additional upscaling and filtering on the received signal and boost the sonic performance further. This drops the battery life to six hours but it offers the potential at least to close the gap on aptX HD and LDAC. Certainly given Audiolab’s track record of late with digital, the omens are good. Another area where some advantage can be eked out is the volume control. This is on a 64 position adjustment, which is better than iOS and vastly superior to the block adjustment of Android. In turn, this is not as many increments as the Shanling but the Audiolab is audible across a greater percentage of its volume range so in reality the honours are roughly even on this. Years of us using phones with their ‘near enough’ volume settings means that when you do have the chance to listen to a device with a proper volume control, it’s a faintly revelatory experience. So far, the Nano has put in a solid show but nothing to suggest that it has got the measure of the more flexible Shanling. From here though, things start to change. First up, this is an attractive and well thought out bit of kit. I was quite hard on the M-DAC Mini because I don’t think it is a great piece of industrial design. I don’t imagine for a second that IAG paid any attention to me at all but the Nano is a much (much) better piece of design. It is compact, well finished and makes good use of a single multi colour LED to tell you what it is up to at any given point. Pairing is aided by voice prompts and it works in a logical and very stable way. If two equally proficient people were left to pair the Shanling and Audiolab to identical phones, the Nano user would be halfway through The End by The Doors by the time the Shanling user got going. Then, there are the accessories supplied with the Audiolab. 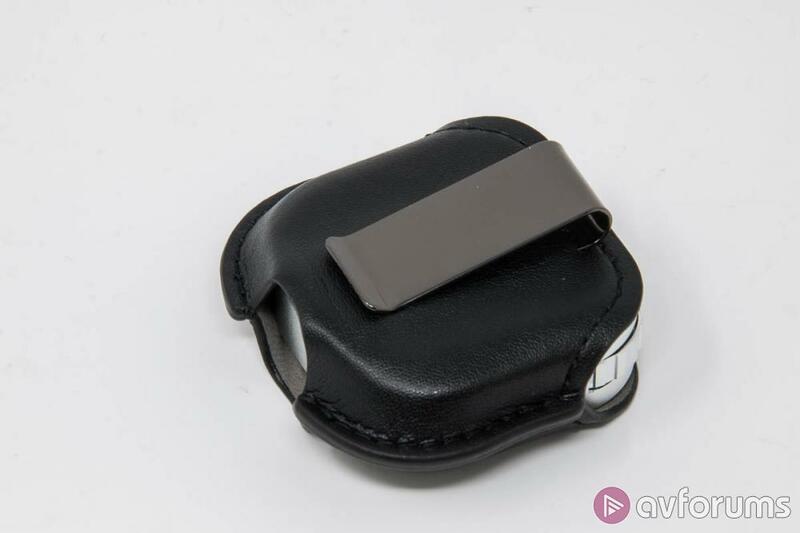 First up is a small leather holder with a clip. This is notable for a few reasons. The first is that it is perfectly judged between being easy to get the Audiolab in and out of the holder and it falling out when you don’t want it to. 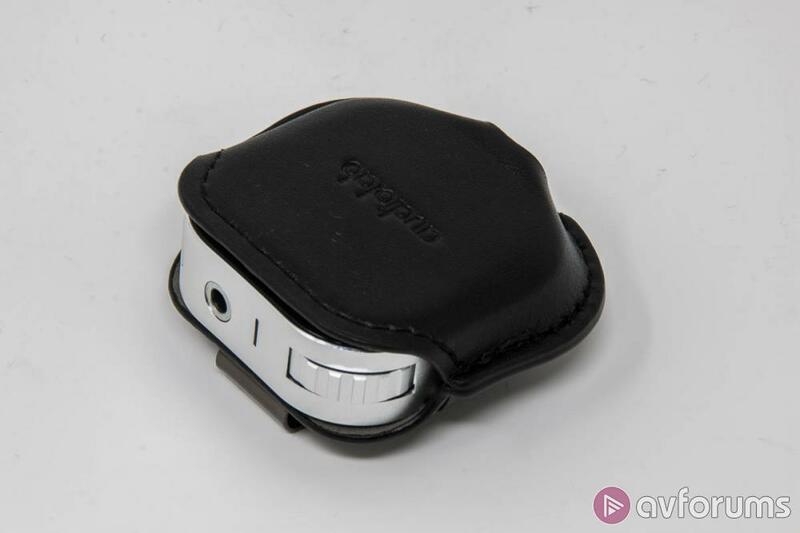 The clip is also both large enough to clip a reasonable distance on to something and also has enough traction to ensure that it will stay put when you do affix it to something. This in turn means you are likely to actually use it. Finally, there is the charger. In what is a first for any audio product I have tested, the Nano uses a wireless charger pad. Being able to just pop it onto the pad at the end of a session out and immediately start the process of having it good to go again is an underrated thing and entirely welcome. This, in a small way, is reflective of a glacial but appreciable move by audio companies to embrace convenience and user friendliness rather than regard it as something for the weak. Against this, the slightly easy to jog volume control and the limited battery life are relatively minor downsides. 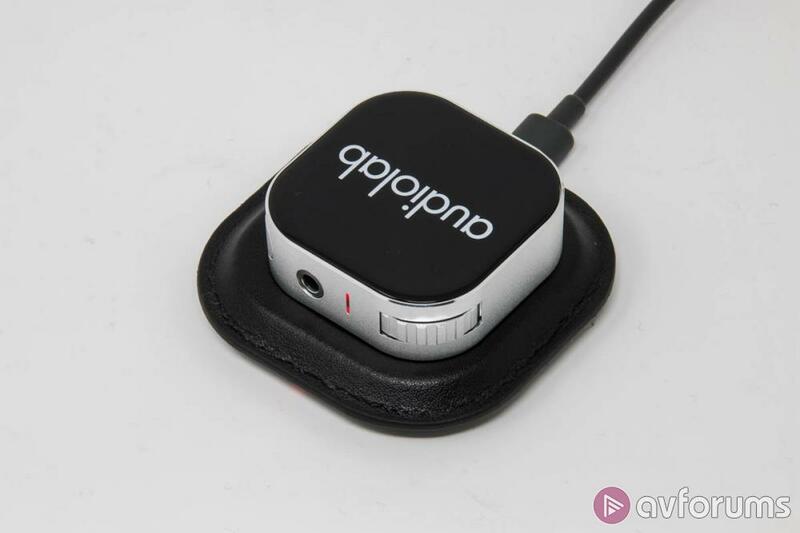 The Nano has done the bulk of its running with an Essential PH-1 smartphone running Deezer, Tidal and accessing UPnP content via Bubble UPnP. Some additional testing has been undertaken with an iPad Air running similar streaming services as well as Netflix and iPlayer. The Shanling M0 has been used as a comparison point. This means that formats have included MP3, FLAC and on demand video content. The earphones used for testing have been Audiolab’s own M-EAR 2D and the Sennheiser IE800S. Having paired the Audiolab to the Essential PH-1- something made simple thanks to the LED and clear voice prompts, I started listening to the Audiolab in the ‘normal’ non enhanced mode. The good news is that all of the basics that should be expected (but are not universally applicable) of ‘audiophile’ Bluetooth equipment in 2019 are delivered. There is no background noise, no dropouts and precious little sense that you are listening to anything with a short range wireless network in the process. There is also no shortage of output power. With earphones in particular, unless you own a real oddity like the recently departed RHA CL1, it is highly unlikely you are going to run out of headroom with the Nano. With the Sennheiser IE800S - an earphone that responds positively to a bit of driving, the Audiolab is a convincing piece of kit. The fine adjustment on offer is an underrated pleasure too and with streaming services in particular, where a single playlist can have as many volume levels as it does tracks, it makes for a happier listening experience. Beyond this base level of technical accomplishment, the Audiolab sounds very, very good. Ever since the original M-DAC, there hasn’t been a duffer in the range and the Nano doesn’t let the side down. Everything about the performance is underpinned by a fundamentally accurate presentation. Standard tests of this like Regina Spektor’s Consequence of Sounds - still one of the most deceptively challenging pieces of music going - see the Nano give you a piano that sounds correct and has the required heft to feel like a half ton instrument is being played rather than a keyboard. Spektor’s vocals are easy to follow and have a relationship that convincingly has her sat at the piano. This is not something that is always easy to achieve with headphones and earphones (and even with the best efforts of the source, some headphones and earphones will never deliver on it) but it comes naturally to the Nano. From these foundations, the Audiolab proceeds to be a consistently fun listen. Give it something with a time signature that has the potential to nod heads and it will deliver on that. The euphoric Tokyo by the White Lies absolute hammers along and really delivers on emotional content. Part of this perceived speed is, in part down to the bass lacking the last hint of outright depth but it’s detailed, quick on its feet and something that will probably partner with a fair few earphones very well. Of course, this is simply running the Audiolab in ‘cooking’ mode. Switching to enhanced mode and giving it all its got is an illuminating experience. On the whole, the results are positive. There are impressive gains to the soundstaging and space given to music and large scale material really benefits from this. The efforts of the Royal Concertgebouw Orchestra in their version of Fink’s Berlin Sunrise are easier to follow and more realistic as a result. It isn’t a universal panacea though. The much, much simpler (and rather more period) recording of Nick Drake’s Parasite makes everything sound a bit bigger and less natural. Something I have found in use that seems contradictory but quite consistent is that this enhanced setting actually seems to do better work with compressed material like Deezer rather than with the lossless feed of Tidal. It ‘fattens up’ leaner recordings and gives some of the weight that the compression algorithm sacrifices to shrink the file. It also seems less likely to result in that ‘unnaturally large’ feeling that can sometimes result with lossless files. It also has some worth with on demand video too. Enjoying an episode of Final Space on Netflix (best title music of recent years, no arguing), it helps boost dialogue and lends open space sequences a bit more, well, space. Given that triggering the enhanced mode is a simple business of pressing the function button, it’s a useful thing to have and easy to switch back and forth between it and the normal music. Beyond this base level of technical accomplishment, the Audiolab sounds very, very good. 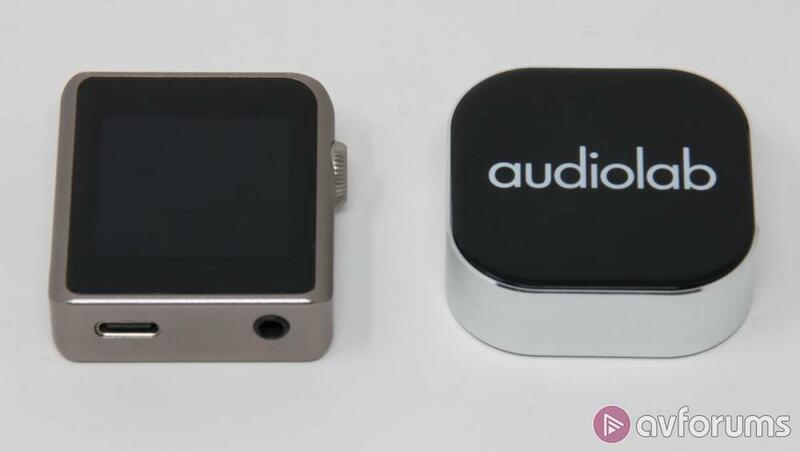 Any conclusion reached on the Audiolab has to include a decision on whether it justifies a price premium (and a considerable one proportionally speaking) over the Shanling M0. Having now spent some time with both, it’s hard to ignore just how good the Shanling is. It is able to do things that the Audiolab can’t for less money and it keeps the M-DAC Nano honest when being used as a Bluetooth amplifier. It remains a sensational little product. If all you want is a Bluetooth amp to pair with a device that has no 3.5mm socket of its own though, the M-DAC does justify the extra money. This is a great Bluetooth amp with a quality and care of implementation and user friendliness that really shines through. It feels and behaves in a way that the less committed among us won’t find an annoyance and in execution terms, it feels like a truly well thought out and implemented product that should hopefully encourage people with a passing interest in quality sound reproduction to want to pursue it further. For these reasons, the M-DAC Nano comes enthusiastically Recommended. Read about our review ethos and the meaning of our review badges. To comment on what you've read here, click the Discussion tab and post a reply. Write your Audiolab M-DAC Nano Digital Audio Convertor review.